Rinnai vs Navien Tankless Water Heaters: Which Is The Best Buy? For households that want to have unlimited supply of hot water, installing a tankless water heater is a wise choice. Although one has to spend more compared to a traditional water heater, it has so many benefits which attract more people to opt for this choice. When it comes to choosing a brand, it can get really challenging considering that there are just too many options available. In the market, you often hear the brands Rinnai vs Navien. So, which one is the better choice between the two. Let’s start off with Rinnai Water Heaters first. Rinnai is a Japanese brand that is located in Nagoya, Japan. They are known for manufacturing home heating appliances, tankless water hears, and boilers. Being in the industry for years, the brand has established itself as one of the trusted companies. What you will like about their water heaters is that the products are designed in such a way that they are compact and wouldn’t consume too much space. Using the latest advancements in technology, Rinnai unit can provide endless hot water supply. In fact, Rinnai Water Heaters have a wifi connection and remote control features that allow users to control settings using their smartphones. When you search for information about the brand, you get to see so many good reviews and positive feedback. We’ve listed down the features of getting a Rinnai water heater. Fast Water Flow: One of the things that you will like about this brand is that you can be sure that the hot water is delivered fast. It is consistent so meaning you get to have an accurate temperature. In other brands, some people may experience interrupted water supply. But with Rinnai, there is minimal fluctuation in temperature and supply of water. Depending on the model you want to buy, there are some units that feature Circ-Logic recirculation that gives more comfort and efficient. There are also models that make use of recirculation technology that comes with thermal bypass valve and built-in pump so you do not have to wait that long to have hot water. High Efficiency: Another major benefit of using Rinnai is that it is known for its efficiency and reliability. When you use the unit, you can enjoy up to 40% savings on energy cost. You also get to have high energy efficiency rating from 80% to 90% depending on the kind of model you want to buy. Venting Options: With Rinnai Water Heaters, you have the option as to whether you want to install it either on the inside or the outside wall. This gives you flexibility and installation is also much faster. Digital Controller: Rinnai Tankless Water Heaters come with a digital controller. This enables you to schedule more than one operation during the day depending on what you need. Another great buy is the Navien Tankless Water Heater. Founded in 1978, it is a South Korean brand that specializes in a wide range of products including HVAC systems, water heaters, and boilers among many others. Navien Water Heaters are known for their efficiency and environment-friendly design. Some brands may only have the capacity to provide 2 to 3 gallons per minute. But Navien can generate 10 gallons per minute or even more. Navien Tankless Water Heaters can provide consumers with a wide range of features and specs that they need. 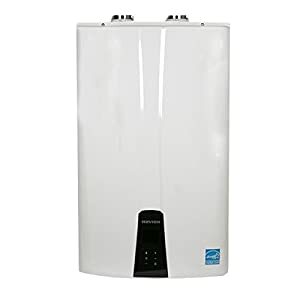 What sets it apart from Navien Tankless Water Heaters is that this brand is designed to provide water supply for clients that need a large volume of water. Superb Performance: Navien Tankless Water Heaters are known for their super performance. You get to have a unit that can last long. Depending on the model you want to purchase like for instance in installing the NPE-240A Premium, you can link more units altogether to have hot water for commercial use. Installation requires venting but with its low-NOx condensing technology, it can be installed both indoors and outdoors. High Efficiency: When it comes to efficiency, this brand will not fail you. It can give you a remarkable heat output, something that you do not often find in other brands. If you prefer to use Celsius, you can always change the display. Navien units have a digital interface where you can just touch the buttons. In terms of energy efficiency, the units are designed to condense technology giving its users highly efficient tankless water heater that can significantly reduce energy costs. This allows you to have bigger savings for the whole household as the brand uses Precision Technology in all of their products. Other Features: On top of these main features, Navien offers other features to consumers which include a one-person installation with its mounting and bracket system making it easy to install, inclusion of buffer tank, recirculation pump and 2’’ PC venting option. Rinnai vs Navien? So, which one should you go for? It actually depends on personal preferences. Both of these brands are known for their efficiency, durability, and reliability. In terms of performance, you can see that both of them also get good reviews. However, they differ in some aspects. Like for instance, if you are eyeing a tankless water heater that has more capacity in producing more volume of water, then you should definitely get Navien. 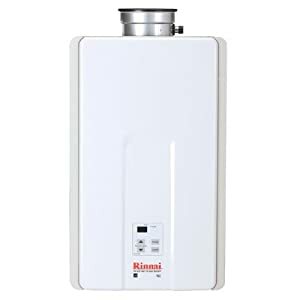 On the other hand, if you want a tankless water heater that has a more compact design but equipped with innovative features and specifications, the Rinnai Tankless Water Heaters would be best for you. Whatever brand it is that you choose, it is a matter of what you need and selecting the best option that fits you.